Over a hundred years ago, archaeologists dug up these nine blackened, corroded lumps of stone from a pre-dynastic Egyptian cemetery. But it wasn't until now that we realized just how old they are—and that they came from outer space. Originally excavated back in 1911 near el-Gerzeh, the beads came from a meteorite that was actually an alloy of iron and nickel mixed with other elements like cobalt and phosphorus—these last two are what helped archaeologists determine its extraterrestrial origins. Because even though the beads are now highly corroded, a team led by Professor Thilo Rehren, director of the UCL branch in Qatar and an expert on the archaeology of metal working, were able to use a non-destructive test called prompt-gamma neutron activation analysis to determine both where they come from and how they were made. By bathing the iron in low-energy beams of neutrons, the actual elements in the alloy absorbed would absorb some of the neutrons and respond by emitting gamma rays. And it's the level of these gamma rays that can offer evidence of otherworldly origins; the gamma rays' energies themselves reveal the type of element, and the peak of these energies reveals the concentration of a particular element. In noting traces of nickel, phosphorous, cobalt, and germanium in the beads, the research team was able to say with near certainty that the beads had to have come from a meteorite. What's more, the presence of these elements (although nickel in particular) makes this space-bred iron far harder than the stuff you'd find laying around Earth. So Egyptian blacksmiths really had their work cut out for them—and it shows. 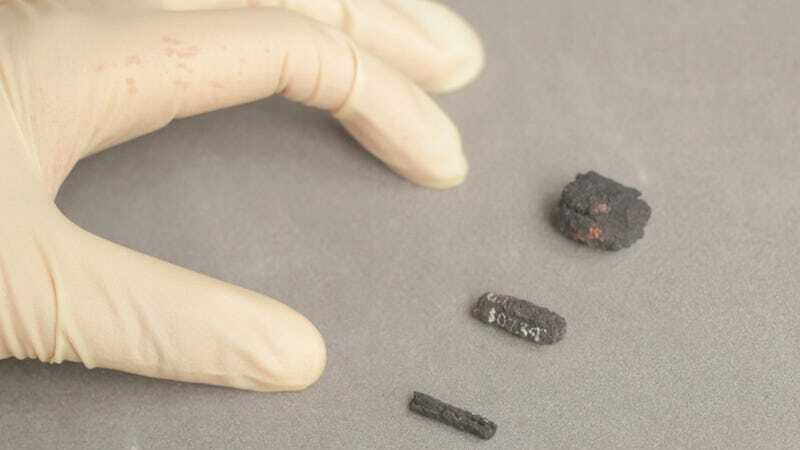 Thanks to X-ray scanners, researchers were able to see that the meteorite beads had to be heated and hammered over, and over, and over again until they were satisfactorily shaped for the underworld. The really exciting outcome of this research is that we were for the first time able to demonstrate conclusively that there are typical trace elements such as cobalt and germanium present in these beads, at levels that only occur in meteoritic iron. We are also excited to be able to see the internal structure of the beads, revealing how they were rolled and hammered into form. This is very different technology from the usual stone bead drilling, and shows quite an advanced understanding of how the metal smiths worked this rather difficult material.